The fourth generation SEAT Ibiza saw the Spanish company's reputation for offering stylish, affordable cars ramp up another notch. With sleek styling and a burgeoning reputation for top notch build quality, the Ibiza rapidly accounted for a lot of the smart money in the supermini sector. Rather unusually for SEAT, it took the company a while to launch a headline grabbing sporting model in the Ibiza line up and this may have hurt initial sales but the Ibiza has won so many awards that recognition is building. A used example makes a whole lot of sense. Launched in February 2002, the fourth generation Ibiza was a good deal more sophisticated than its predecessor if not quite as sporting. The range was spearheaded by the 130bhp 1.9-litre TDi diesel model that seemed rather a curious decision for a company positioning itself as a sporting brand. Supporting this were a wider range of models powered by a 100bhp version of the same engine. Petrol buyers chose from 12 or 1.4-litre 16-valve engines, followed in due course by a 2.0-litre powerplant and a 1.4-litre TDi turbodiesel. In late 2003 the first properly sporting Ibiza was announced, the 150bhp turbocharged 1.8-litre Ibiza FR (Formula Racing). This model was positioned to sit just beneath the flagship sports Cupra models which turned up in the summer of 2004 around the same time that the 2.0-litre engine was shelved. Cupra models are either 180bhp 1.8-litre Turbo engined or powered by a 160bhp version of the 1.9-litre diesel. In the latter stages of 2005, the 1.4-litre TDI diesel engine was boosted from 75 to 80bhp. The spring of 2006 brought a fairly major facelift. The cars were given a sportier edge with aggressive air-intakes carved into the lower reaches of the front bumper. These evoke the ones on the SEAT Leon World Touring Car of the day. At the back, the facelifted Ibiza displays its name centrally on its tailgate, below the large SEAT badge which doubles as the boot release. The Stylance trim was slotted into the mid-range replacing the SX and S models. The Cupra models were dropped from the range early in 2008 and, further mirroring growing environmental concern in the market, the Ecomotive model was introduced with its 70mpg fuel economy. In mid 2008 the new Ibiza went on sale, spelling the end for this model. Although to many 'platform sharing' may be more directly attributable to the myopia of the integrated transport policy than the vision of the Volkswagen Group, it resulted in the fourth generation SEAT Ibiza. Whereas the previous generation Ibiza's range of qualities failed to float the boat of British buyers, this model went some way to rectifying its predecessor's shortcomings. Check one out in the metal and first impressions are that Walter da Silva, the Stylist responsible for this Ibiza, did a good job. 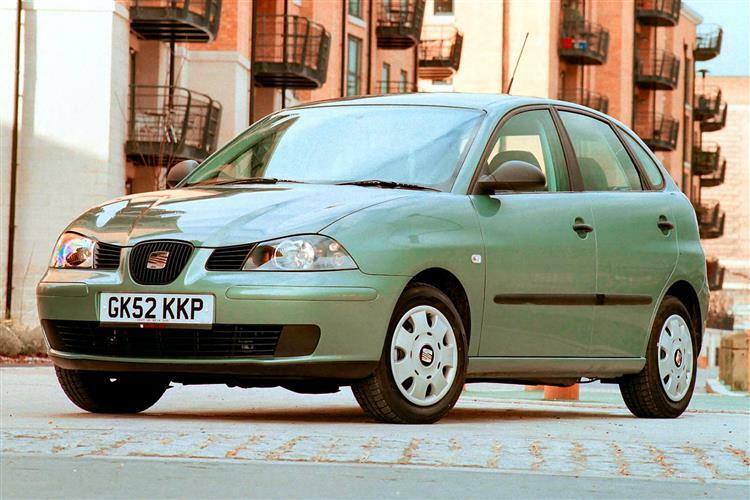 Perhaps SEAT were taking their proposed position as a Spanish Alfa Romeo more seriously than we at first considered when they poached the man responsible for the Alfa 147 and 156. This is certainly a car he can be proud of. If you were asked to pinpoint the differences between this generation and its predecessor it wouldn't be easy, but da Silva kept the basics in place - the cyclops grille, the chubby posterior and the high waistline - but stroked, smoothed and melded the lines into something far sleeker. The details are more knowing and better integrated and he's succeeded in making the car appear far smaller than it actually is, a visual trick that will appeal to many buyers. Inside, you'll spot a number of VW Group parts, reappearing like old faces at a school reunion. The window switches, the gear knob, the ventilation controls and so on are all sourced from that bottomless well that's disparagingly termed the VW parts bin, and are none the worse for it. The roofline is lower than in Polo and Fabia variants of this era, but otherwise the cabin holds few surprises other than a rather novel textured plastic that's softly abrasive but not particularly great looking. That's not to say that da Silva hasn't left his mark however. The dials are recessed individually into the facia in true Alfa style, giving the cabin a sportier feel. Trim levels started with the basic 1.2-litre model which is nonetheless still pretty well equipped. Expect to find air conditioning, tinted glass, a body-coloured rear spoiler, remote central locking, an eight-speaker stereo system, electric windows, a split-folding rear seat, electro-hydraulic power steering, a pollen filter and twin front airbags. Unfortunately, three-door customers will have to budget for Sport or SE variants if they want the really useful 'Access-Plus' front passenger seat. Here, as the front seat is tilted, the seat cushion lifts and moves forward as the backrest folds, creating a 31cm gap from the B pillar to the back of the front seat through which rear passengers can pass. When the front seat is pulled back, everything returns to its original position. 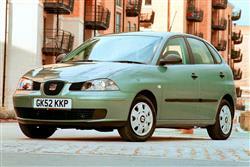 A shake up of the trim designations coincided with the arrival of the Cupra models in mid 2004. Prices and equipment levels were dropped slightly while the trim line-up became Reference, S, SX, FR and Cupra in that order. The Access-Plus seat became an optional extra on non-sporty 3-door models. Compared to its predecessor, this Ibiza is a dramatic improvement. Not only is it far prettier, it also utilises its cabin space better, the engine range is far more economical and the perceived quality has been ratcheted up a good few notches. None of these factors, however, differentiate it hugely from its rivals. The 1.9 TDI diesel engines are the pick of the range if you're into smooth cruising, but are too heavy to provide much fun through corners. Not surprisingly, the 130bhp is the better choice, being not only faster but rather curiously, much quieter. The 1.4-litre TDi is a good compromise between agility and power. The lithe 2.0-litre petrol car handles reasonably well but doesn't have the verve to occupy the attention span of your average press-on driver. The three-door 2.0-litre Sport version at least looks the part. If you really want to press on you'll need to track down a 150bhp Ibiza FR petrol, the 130bhp FR TDI or go all out for one of the Cupra models. These come in either 160bhp TDI or 180bhp 20-valve turbo form. Good luck. Tried and tested engines, the VW-standard quality auditing and an inherent feeling of solidity all bode well for the Ibiza's reliability. Having been on sale for such a short duration it's perhaps inevitable that no major faults have emerged, but watch out for neglected ex-hire cars. The Ibiza is a car where the price differences between good and bad examples aren't too great, so be fussy. Look for a fully stamped up service history and reject anything that looks in any way tatty, grubby or vaguely dog-eared. (approx based on an Ibiza 2.0 Sport) SEAT spares are reasonably priced, with consumables starting at just £4 for a spark plug. An air filter costs £20, a timing belt £40, an oil filter is £9 and a fuel filter a mere £6. Keeping a nearly new Ibiza on the road shouldn't prove too expensive. The Ibiza was positioned as a more dynamic alternative to the Fabia, if not as opulent as the mini-me Passat that is the Polo. The engine choice runs to three petrol engines and three diesels. The petrol powerplants consist of a three-cylinder 1.2-litre that ekes 64bhp from the ether, a 75bhp 1.4 and the venerable 115bhp 2.0-litre petrol powerplant. Two 1.9-litre turbodiesels are offered, one cranking out 100bhp, the other generating a healthy 130bhp and there's also a budget 1.4-litre TDi good for 75bhp. There are no rally replica Cupra versions yet, although they must be in the pipeline. The Ibiza FR's 1.8-litre powerplant is more than just worthwhile. With a turbocharged 150bhp to call upon, it's capable of notching off the all important sprint to 60mph in a respectable 8.1 seconds and it'll then run onto a top speed of 135mph. Using the same engine fitted to the entry-level Audi TT, the Ibiza FR can even manage an average of 46mpg which means that younger drivers won't feel the pinch every time they give the accelerator a quick prod. With a top speed of over 142mph, the 180bhp petrol version of the Cupra doesn't hang about. Couple that with an ability to polish off the sprint to 60mph in just 7.1 seconds and you've got a potent, if not premier league, hatch. What's more, the 160bhp diesel version is only slightly slower against the watch, making 60 in 7.4 seconds and recording a top speed of over 136mph. Where the most powerful diesel in the hot hatch segment scores highest is in terms of fuel economy. Although the 1.8 20VT model will travel for 39.6 miles on a gallon of fuel using the combined test method, the diesel will eke a massive 53miles from a gallon. If you want a mildly sporty supermini but don't want to compromise on quality and don't want to end up paying through the nose, the Ibiza is the logical choice. Once you've sampled it you'll have a lot of difficulty writing a cheque for anything else.